Have you ever looked up at the stars and sometimes wonder what their names may be? The nightime sky can be a wondrous, fascinating and mysterious world. One cool way to identify, to children, which star or constellation you’re referring to, is to use a flashlight. The beam will reflect through the atmosphere and act as a pointer stick! A pair of binoculars are also a handy tool. This activity can be used for both Girl Guides/Scouts and Boy Scouts for their Astronomy badge. Let’s cover some of the major constellations in the Northern Hemisphere which are easiest to locate. They are: Orion, the Big Dipper, Cassiopeia, the Milky Way and Pleiades. 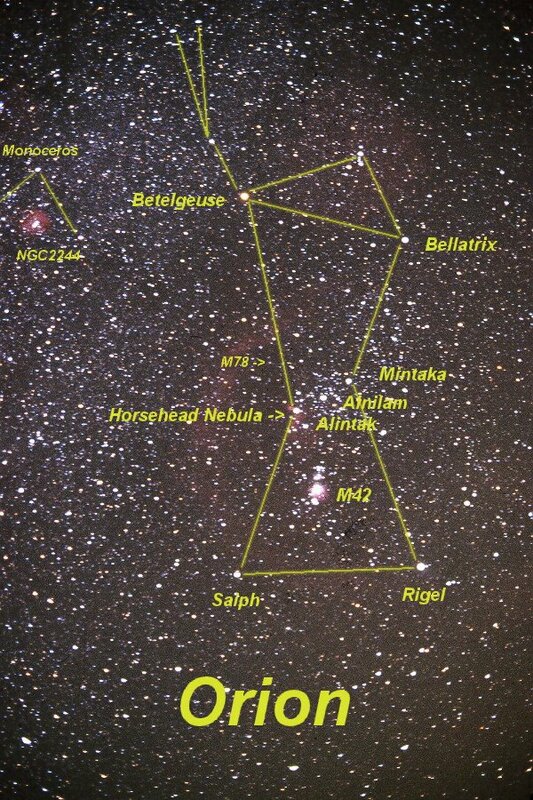 I will also show how to locate the North Star in the Little Dipper. The Inuit believed that the stars were living things who must wander through the heavens for an eternity, never straying from their path. One story is about Pleiades (pronounced play-deez), in the constellation Taurus the Bull. Nanuk, (pronounced nan-ook) the bear, was out on the ice wandering and looking for food, when he came too close to a pack of hunting dogs. He knew the dogs were a danger to him, so he tried to give them the slip, however, the hunting dogs gave chase. Nanuk ran as fast as he could over the ice, but the dogs stayed close on his heels.. The chase went on and on with neither Nanuk nor the dogs noticing that they were at the edge of the world. They all slid off and into the night sky and turned into stars. Pleiades, is one of the brightest and closest star clusters to earth. It contains nearly a thousand stars. On a clear night, you may be able to identify 14 stars with the naked eye. The Seven Sisters are most prominent between October and April. 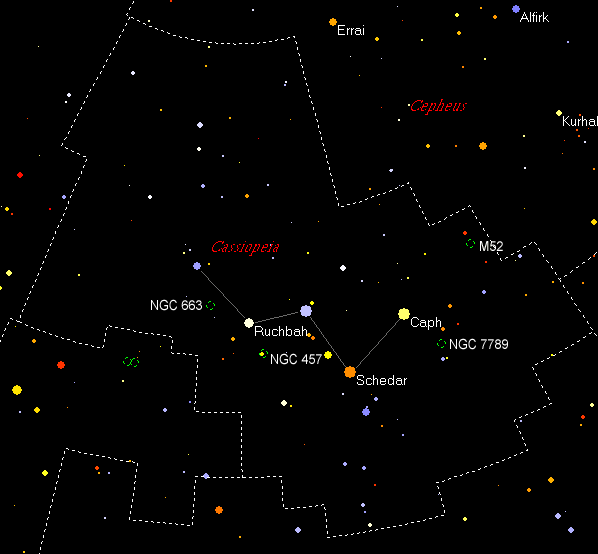 In early November, the cluster rises in the east after sunset. In February it lies overhead in the evening. In May, it sets at sunset, before Orion. 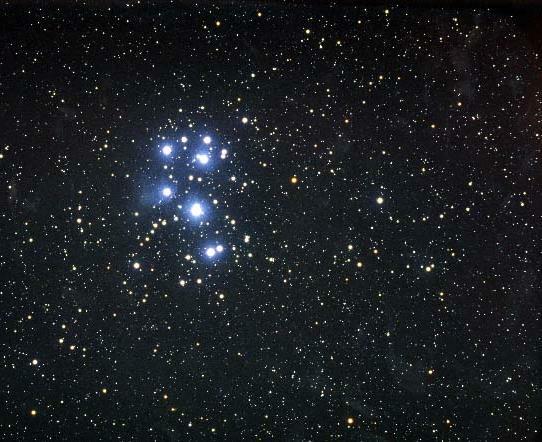 Pleiades is also known as the Seven Sisters in Greek mythology. With them is their mother, the nymph Pleione. Their father is not with them as he is the Titan, Atlas. Atlas has been doomed by Zeus to hold up the sky from the Earth forever. By chance, Orion caught sight of these sisters and their mother. He rather liked them, and started to chase them all over the face of the Earth. Zeus felt sorry for the sisters and their mother, so he changed them into a flock of doves, which he set in the sky. Zeus, was an Olympian God and Atlas was from an older set of gods, called the Titans. The Olympians were at war with the Titans, so Zeus didn’t like Atlas much. Atlas’ punishment was to hold up the sky from the Earth for eternity and Zeus thought that by putting Atlas’ wife and family in the sky, it would be a further punishment for Atlas. The Pleiades are found not far from Orion, so he is eternally chasing them across the sky! Only six stars are distinctly visible to the naked eye. The ancient Greeks have several stories about the disappearance of the seventh star. One such story is about, Electra, an ancestress of the royal house of Troy. After the destruction of Troy, the grief stricken Electra abandoned her sisters and was transformed into a comet. In Chinese mythology, Pleiades is the mane of the White Tiger of the West. For me, I didn’t know that a tiger had a mane! Orion is a prominent constellation and one of the most recognizable in the night sky. It’s most prominent and brightest stars are Betelgeuse (pronounced beetle juice), a red super-giant and Rigel, a blue-white star. Side note: If you follow off the star, Selph, bottom left side,at a downward angle, you will arrive at the star, Sirius, the brightest star seen from Earth. 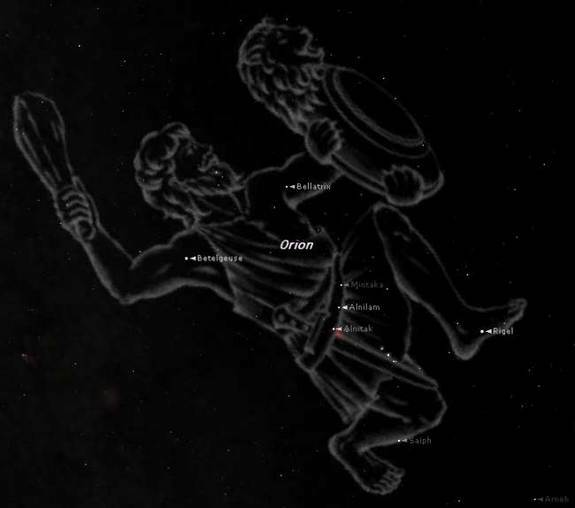 Greek: Orion is named after Orion, the hunter, from Greek mythology . He was a hero who hunted with Athena, also a hunter, goddess of the Hunt and of the Moon. She was also known to hang out with heroes and is the creator of the olive tree. Athena was also credited with killing Orion. Other legends say it was a scorpion (Scorpio) who killed him. Zeus placed him in the night sky, after all, he was a hero! 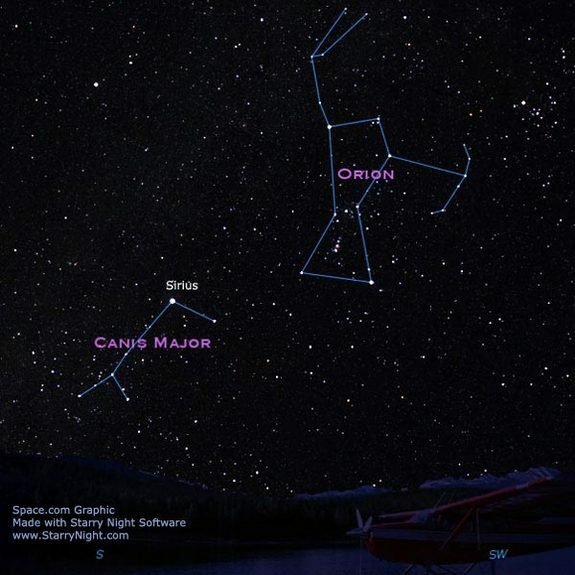 Navajo: This tribe used Orion as a kind of calendar. in May, when Orion sets (below the horizon) and was not seen again, the Navajo knew it was time to plant their crops. The Milky Way is the name we give our Galaxy. It was once thought that it was a barred spiral with four star-forming arms, named Norma, Scutum-Centaurus, Sagittarius and Perseus. 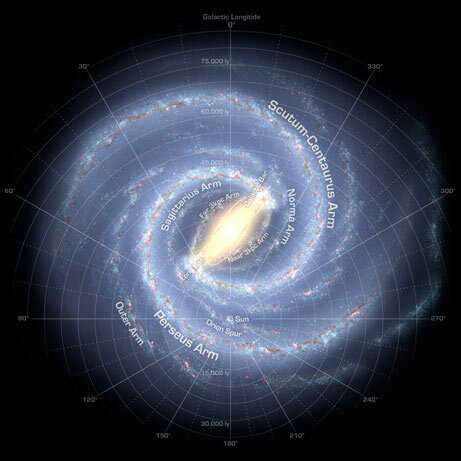 In June of 2008, images from NASA’s Spitzer Space Telescope revealed that the Milky Way is a barred spiral with only two major arms, thereby demoting the Sagittarius and Norma arms to minor arms. Our Sun lies in a minor arm, named the Orion Arm, or Orion Spur, sandwiched between the Sagittarius minor arm and Perseus arm. Check the larger image and you can see the location of our Sun. To spot an arm of our galaxy, look up into the sky, find the trail across the sky. It contains a lot of stars so appears milky. You can find the constellations, Cassiopeia, Cygnus the Swan, and the upper arm of Orion in this band of light. The star Sirius is close by. Long, long ago, when the world was young, there were only a few stars in the sky. During this time there lived an old man and his wife. To make a living they ground corn into cornmeal. They stored it in large baskets. During the winter, the people of their village would trade other things for the cornmeal. From the cornmeal they would make bread, bannok, and mush. One morning, the old man discovered that the cornmeal baskets had been gotten into. He and his wife were very upset. They knew that the Cherokee people did not steal from each other, so who could it be? Then, they noticed cornmeal scattered on the ground with giant dog paw prints there as well. They told the people of their village and it was decided it had to be a spirit dog. They needed to scare it away or it would eat all their food. That night, all the people took their drums and shell rattles and hid in the bushes. Late in the night, they heard a whirring sound. They looked up and saw the giant dog swooping down from the sky. They waited until the dog started eating the cornmeal, then jumped up and banged their drums and shook their rattles. The sound was so loud, it sounded like thunder. The giant spirit dog was so scared, he ran to the top of a hill and jumped back into the sky. The cornmeal he still had in his mouth, started spilling out the sides as he ran. Each grain of spilled cornmeal became a star. There lived a very beautiful and charming princess, named Chuc-Nu. She was one of the many daughters of the King of Heaven. Chuc-Nu was very hard-working and was often seen sitting on the shore of the Silver River to sewing clothes for her younger sisters. One day a young man herded his buffaloes to the river. His name was Nguu-Lang. He was very handsome. He fell in love with the princess at first sight, and she loved him, too. The King of Heaven, fully aware of their love, consented for his daughter to marry Nguu-Lang. But the couple had to promise to continue their work after their marriage. They enjoyed being married so much they forgot their promise. The King became furious and ordered them to separate. Each of them would live on one side of the river and could only look at each other from across the river. The King allowed them to meet once a year in the seventh month of the lunar year. This month is called “The Month of Sudden and Short Showers”. When they meet each other, they usually cry for joy. They cry even more bitterly when it is time for separation. 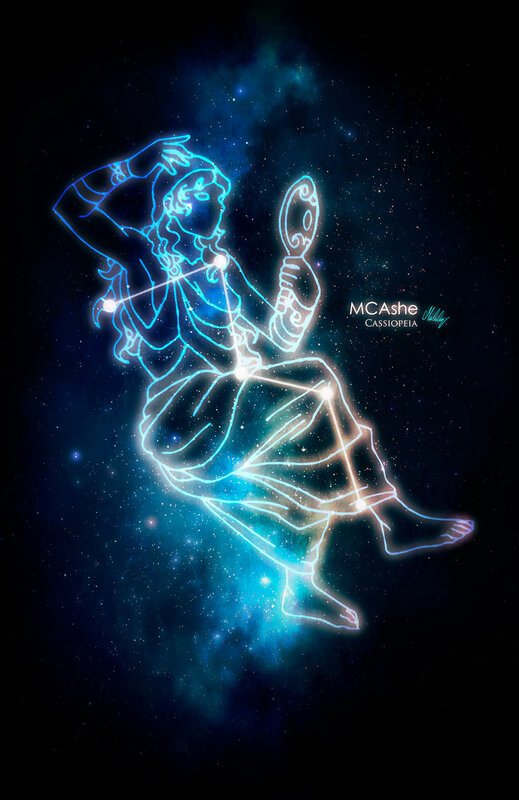 Queen Cassiopeia (Cass-ee-o-pea-ah) was married to King Cepheus, and they ruled Ethiopia. She often bragged that she and her daughter, Andromeda, were the most beautiful women in the land, even more beautiful than the sea-nymphs, the Nereids. The Nereids were upset by this and complained to the sea god, Poseidon. Poseidon threatened to send a sea monster and a flood to destroy the land of Cassiopeia and Cepheus. Cepheus and Cassiopeia discovered that the only way to save their land was to sacrifice their daughter, Andromeda, to the sea monster. They tied her to a cliff by the sea. Before the monster could eat her, along came Perseus, and saved her. He slew the sea monster, and then married Andromeda. It is said, that Poseidon chained Cassiopeia to her throne to punish her for being so boastful. To remind others to not be so boastful, she hangs upside down for part of the year. In the ancient Celtic world Anu was the mother goddess and considered to be the mother of all the gods; the Tuatha de Danann. Some say that she is the mother earth goddess or the Goddess of fertility. On the Cork Kerry border are two mountains called the Paps of Anu (pap is another word for breast.) On the top of each mountain are stone structures or cairns that when viewed from a distance make the two mountains look like a pair of breasts. Anu was known, in the Celtic World, by several similar names: Danu or Don being the most popular. She was a Mother-Goddess, the wife of the Sun God, Belenos, and considered to be the ancestor of all the Gods, the Tuatha dé Danann, who found themselves obliged to reside in the Otherworld when Miled brought the Celts to the British Isles. 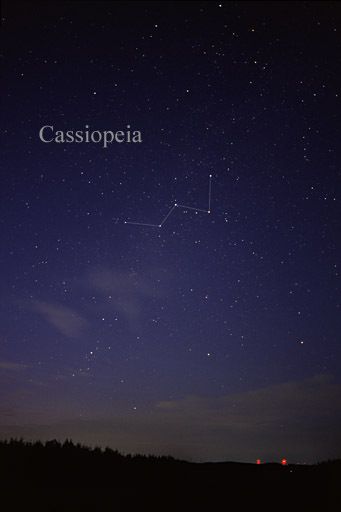 She still looks down on us from the night’s sky where she appears as Llys Don, better known as the constellation of Casseopeia. 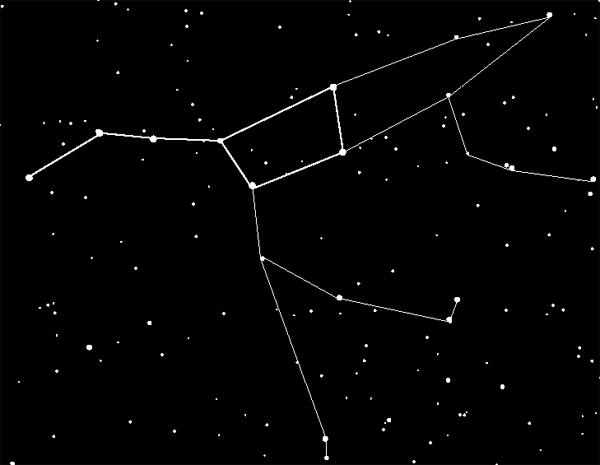 The Big Dipper is only a part of a larger constellation called Ursa Major, the Big Bear. It can be difficult to distinguish the other parts of the bear especially if the seeing (upper atmosphere) is cloudy. 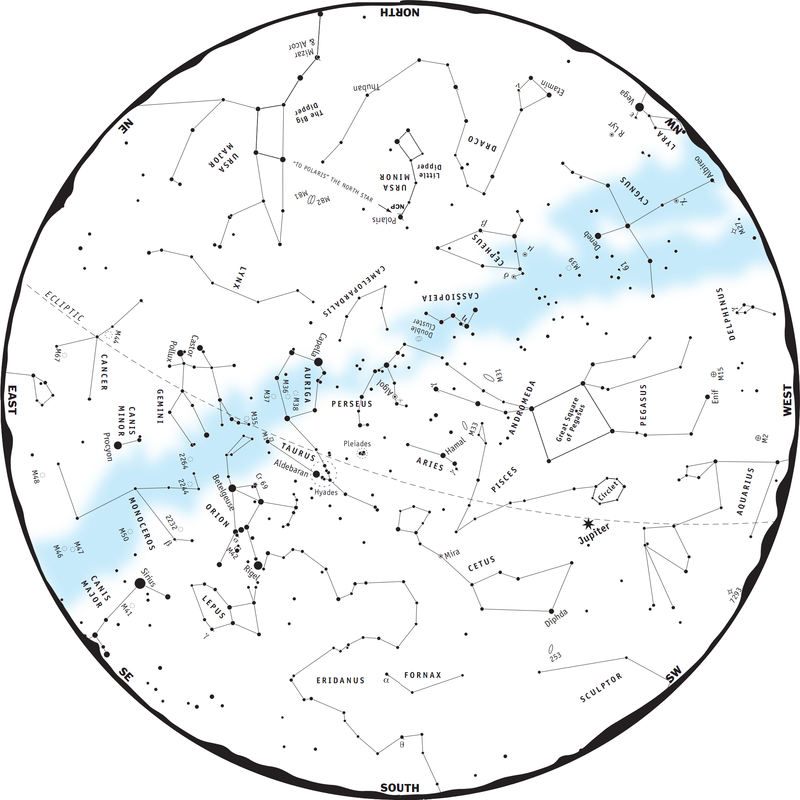 However, most of the stars in the Big Dipper portion are often clear and easy to identify. This constellation pattern of 7 (8) stars is the oldest recognized pattern in the night sky. Its legends may go back as far as the Ice Age. It has been many different objects in many cultures. A plow, a wagon (German), coffin (Arabic), chariot (Irish), skunk, shark, grain measure (Chinese peasants). canoe, hog’s jaw and many others. Several cultures see it as a bear, and many mythologies show a kinship between bears and humans, perhaps because the bear can stand on two feet. 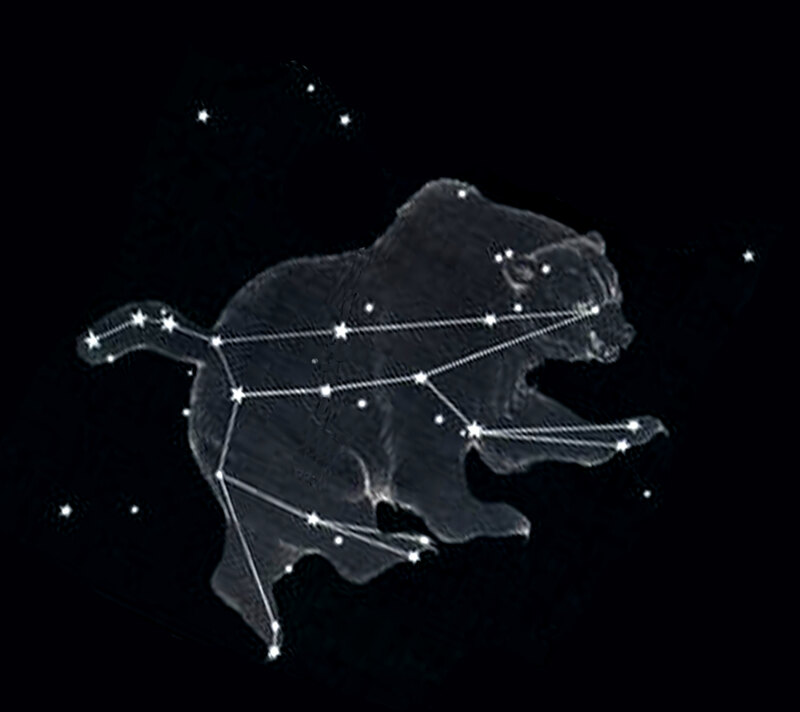 As Ursa Major travels through the sky, sometimes the bear is quadrupedal and sometimes bipedal. Stories in some cultures have people taking the form of bears and in some, bears are gods. A Cool Army Story Long ago, when warriors fought with clubs, swords and bows, the army captain needed to know whom of his bowmen had the best eyesight. How he determined this was to have his bowmen look up at the handle of the Big dipper. He asked them to look and tell him how many stars made up the handle of the dipper. They were not to include the star where the handle joined the pot. Those who said there were only 3 stars did not have good eyesight, but those who said 4 stars did. The bowmen with good eyesight were further back in the formation, while those with poor eyesight were in the front row. Better to be in the back rows I say! So…where is that 4th star? Look where the highest point is on the handle curve (the second last star). There is really two stars there! There names are Alcor and Mizar. Mizar is the brighter of the two. They are binary stars, which means they are caught in each others gravitational pull and revolve around each other. In this story, the four stars that form the quadrangle of the dipper, represent the bear. This bear is being chased by 7 hunters. The 3 closest hunters are the handle of the dipper. As fall approaches, the 4 furthest hunters (stars) dip below the horizon and it is said that these hunters have given up the chase. The 3 closest hunters are named after birds. The closest is Robin, followed by Chickadee and then Moose Bird. Chickadee is carrying the pot to cook the bear in. Remember the double stars of Alcor and Mizar? Alcor is the pot! In the fall, the bear looks to be standing on two feet, so has stopped running. Robin shoots and wounds the bear with an arrow. The wounded bear sprays blood onto Robin who then shakes it off. As the blood falls to earth, it covers the trees, turning the leaves to red. Some of the blood stays on Robin and he is then called Robin Redbreast. The bear dies and the hunters then eat the bear. The bears skeleton travels across the winter sky on his back. In spring, a new bear leaves the den and the chase begins again! This star formation to the Arabs is a funeral. the 4 stars of the quadrangle is the coffin and the stars in the handle are the mourners following the coffin. 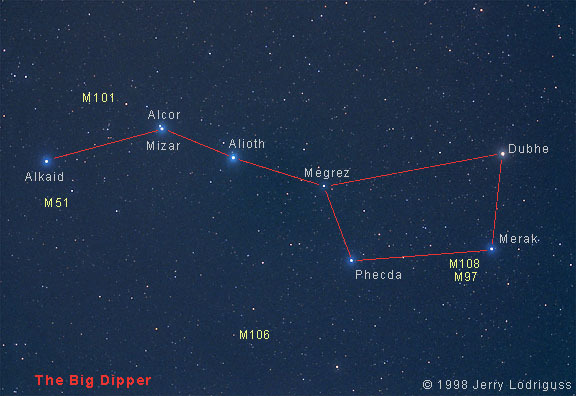 The two stars (Mizar and Alcor) are the son and daughter of the man in the coffin. His name is al-Naash. al-Naash was murdered by al-Jadi (the north star). The god Zeus hid the nymph Callisto from his wife Hera by changing her into a bear. Her son, Actas, did not know she was now a bear and while hunting one day came across Callisto. To keep Actas from accidentally killing his mother, Zeus placed them together into the sky as the Big and Little Bear (we know them better by the names Big and Little Dipper). 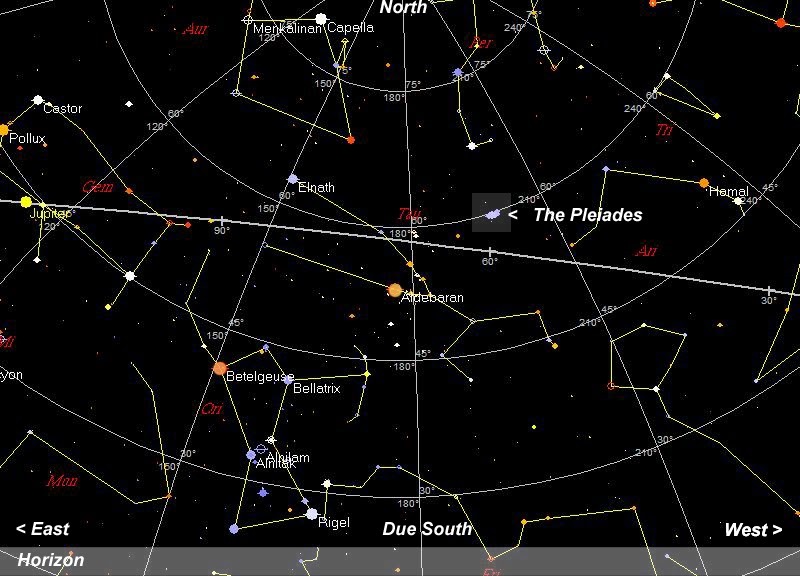 Using the “pointer” stars in the Big Dipper to locate the North Star (Polaris) and other major stars in other constellations. I do hope you enjoy star gazing! Next week I will cover a few more constellations and a few planets that are visible this time of year in the Northern Hemisphere!